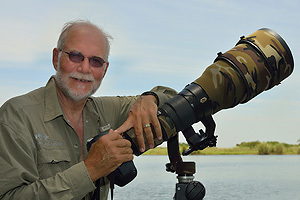 Lou started Photography 39 years ago as a high school pupil of then Helpmekaar Boys High School in Johannesburg. These early years in a Black and White darkroom as well as his involvement in sport and sport photography from an early age have been a major influence in his wildlife photography to this day. Before becoming a full-time sport photographer Lou was involved with The Photographic Society of South Africa for many years. “I will always be indebted to the PSSA for the solid photographic foundation I received.” says Lou. The initial years as a professional Sport Photographer saw Lou receiving a second runner up, first runner up and overall winner award in the Allied Bank South African Sport Photographer of the Year competition in the three years that the competition ran. More than anything his years as a Sport Photographer, which were followed by a commitment to Portrait photography, shaped Lou’s current approach to the Wildlife genre. He is in a constant search for exquisitely-lit, dynamic action images shot against clean backgrounds. “I will be honest, only when the action is not happening will I start looking for the graphic image.” Lou was rewarded in 2007 and 2008 with a first runner up award in animal behaviour and animal general, as well as 2 top 10 certificates in both categories of the Getaway & Fuji Film Photographic Awards. In 2010 and 2011 Lou was honoured by Nature’s Best America for his outstanding work and 2 images were selected, one of which was chosen to feature in the annual 12-page calendar while the same image was selected to be exhibited in the Smithsonian Natural History Museum. Lou was also the chief photographic moderator for The African Photographic Awards 2010. In 2012 Lou received two highly regarded awards for two images in the African category by Nature’s Best America and was awarded overall winner in the “Birds as Art” International Photographic Competition for an image of a baby Jacana. Once again in 2013 Lou received an esteemed top-10 award in the Africa category in the Nature’s Best America Photographic Awards. This was followed by an award in the “Mammal Wildlife Behaviour” category of the BBC Natural History Museum International Competition.